New Year's Eve is upon us. We spend this time remembering the past year and looking forward to the new year. Sometimes we start to fret about all the bills we have made over spending on Christmas. The kids start to worry about going back to school in a few days. Of course some of us look forward to getting the kids back to school and things getting back to same o same o. I don't know about you but January is usually my down time of the year. Once school starts in August the time just fly's by so fast. This year was no exception. I am normally very busy in the fall, but this year was especially busy. Last year I started making soap and before I started my friend already had me in business. Of course she knows me well enough to know that I would be addicted to making soap. What can I say, it's FUN!! My first year I did a few craft shows that didn't turn out very well. People just weren't going out and spending like normal. I was so bummed! Then the summer came and I was able to get into the craft barn at the Thresher's Reunion in Denton NC. What a turn around. People were buying and more importantly they were really interested in the soap. Part of being in the craft barn is to demonstrate or teach. Can you imagine it? I was teaching! I taught four classes a day, if there were students. At the beginning of the year I did start to dabble with lip balms, lotions and scrubs. Of course it is a natural progression. After all you already have most of the ingredients. I taught classes on Lip Balms, Lotions, Body Scrubs and Cold Process Soap. The five days started a little slow but that was okay. It gave me a chance to settle in and organize myself. By the end I could barely talk. If it weren't for my daughter and a friend being there to take care of customers I don't know how I would have made it. The last day I actually taught 5 classes. I had someone want to take a class on lotions, but the class wasn't going to start for a while. However, I was just starting to make some of my Bug "B" Gone lotion because I was running low and it was selling. So I gave her a class while I was making my double batch. Boy, was I jazzed after that! I had to get to making soap. I knew that things were starting to take off and I didn't have enough product. Of course the fact that the soap needs to sit at least a month before I can sell it means you have to plan things out. Thanks to my local Etsy group we started having a craft fair once a month in Greensboro. It is more like a city street fair with local musicians singing and some other acts. Boy that is so much fun! I actually have customers coming back each month to buy more soap. I am sure anyone out there that has started a business has gone through this feeling of "I can't believe they like it!". It is so cool to think that I can create something that so many people like. I keep having this feeling from time to time. I actually hit it with my "My Tea Tree Body Cream". I know I don't have it for sale on my site yet but my goal in January is to kick it up a notch or two. This fall was such a big boost to business. I have more than soap now and I feel really good about most of the things I have been producing. Of course there are some items that need more work but I am getting there. My biggest boost was a friend of mine from High School placed a big order of gift boxes. That got me thinking in a bigger direction. Then I got a call from a First Friday customer that placed a big order for scrubs. I can't believe this! This is actually turning into a real business not just a hobby. Well, now that we are at the end of 2009 it is time to look too 2010. Now that I have my blog going I am going to use it. Hopefully I won't bore any one out there. My goal for 2010 is to keep a journal type thing going. It may not be everyday. It may not even be about soap. The reason I named my business Donna's Delights is because my interests are large and I really like to learn how to make new things. So you may never know what I might add. This year I made some ornaments to sell. I learned how to make them a few years ago but didn't make any to sell last year. This year I did. I even sold several of them. Of course I like to knit as well. I do make linen soap bags that seemed to be popular this year. 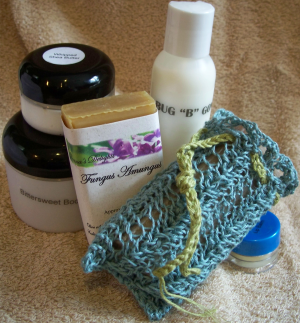 From all of my research and reading other soap blogs it seems that knitting and soaping go together. I am not sure why. I was actually knitting first. So, Here's to 2009. Thanks for the memories and the many life blessings. Did I mention I became a Grandma this year? You may be seeing a lot of Alexis, so look out!